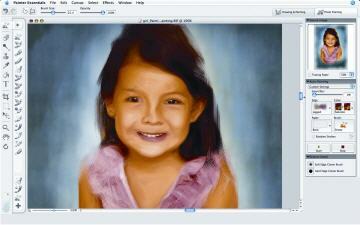 Create a painting from a photo on Mac in just three steps: Open the photo you want to paint in the Source Image palette. You can create a painting from a photo in just three steps: Open the photo you want to paint in the Source Image palette. Your photo will be saved with the Painter Essentials file format, so it's easy to return to a project later Choose one of the preset painting styles from the menus on the Auto-Painting Palette to get the look you want Let new Smart Stroke™ technology create stunning paintings—with brush strokes that follow the form of your photo! Explore Learning Materials Free video tutorials by Painter master John Derry, combined with the tutorials printed in the user guide, make it easier than ever to get started—and get the results you want. Corel Painter Essentials 4 for Mac OS allows you to Create a painting from a photo in just three steps: Open the photo you want to paint in the Source Image palette. ImTOO DVD to Picture for Mac - capture, output the images captured and save them as static pictures in JPEG, PNG, GIF, BMP, or animation in GIF and Flash. iWinsoft Page Layout Designer for Mac - the ideal desktop publishing program for business, and small- and home-office professionals who want to Design and print high-quality publications with great ease. 4Media DVD Frame Capture for Mac - excellent DVD image capture and DVD image creator software with powerful functions to capture pictures from DVD-Video and DVD folder. SyncMate - FREE and easy-to-use synchronizer for Mac and Pocket PC, that will help you keep all your documents, text messages, contacts, calendar entries and events and other stuff well organized. Advanced Mac Mailer - send out personalized bulk messages and handle multiple lists with unlimited number of subscribers in each list. Mac Pilot - easily enable and disable hidden features in Mac OS X, optimize and repair your system, and perform numerous routine maintenance operations with the click of a button! iSkysoft DVD Copy for Mac - a powerful Mac DVD burner software that can copy DVD movies(D9 to D9, D5 to D5), and even remove DVD protections such as CSS, RC and RCE. ImTOO Video to Picture for Mac - Multifunctional Mac picture capture software which helps you extract pictures from various video formats such as MPEG, DivX, Xvid, AVI, RM, MP4, M4V, MOV, WMV etc. ImTOO iPod Computer Transfer for Mac - A powerful Mac iPod/iPhone transfer software which can helps you transfer iPod/iPhone music and video, iPod podcast and TV program to Mac within a few seconds, and vice versa.